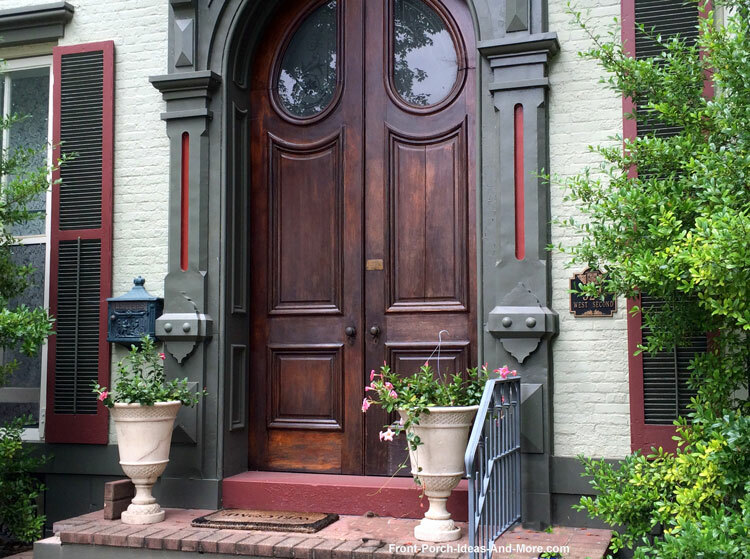 It's hard not to notice beautiful exterior front doors. 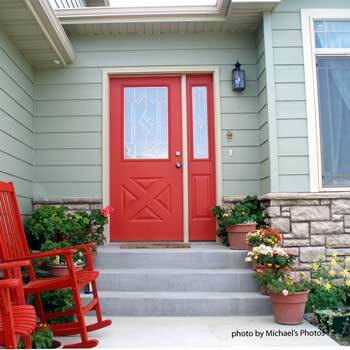 Whether solid hardwood or painted a vibrant color, front doors make a statement on your porch. 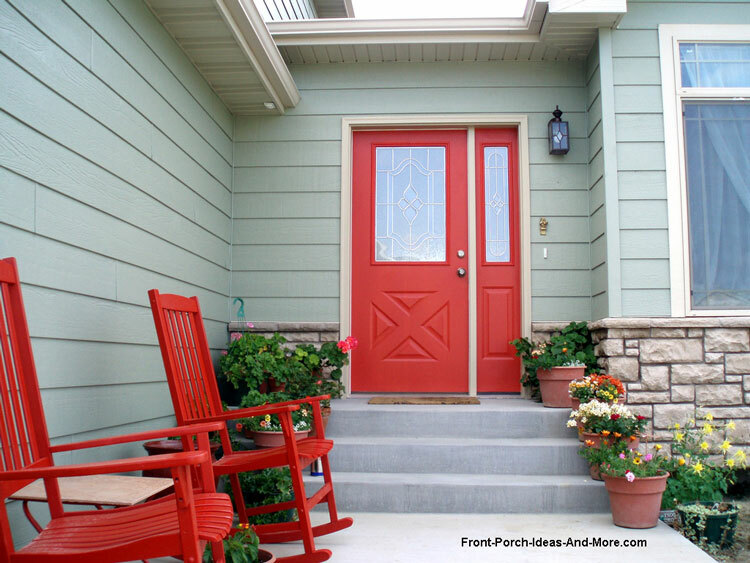 Want instant curb appeal - paint your front door a vibrant color! Or, select an exquisite wood door with light panels. No matter your preference, the front door is something everyone sees. If choosing a wood door ensure it is protected somewhat from the weather and are very popular for porches with extended roofs. Fiberglass, on the other hand, can be used no matter your weather conditions. 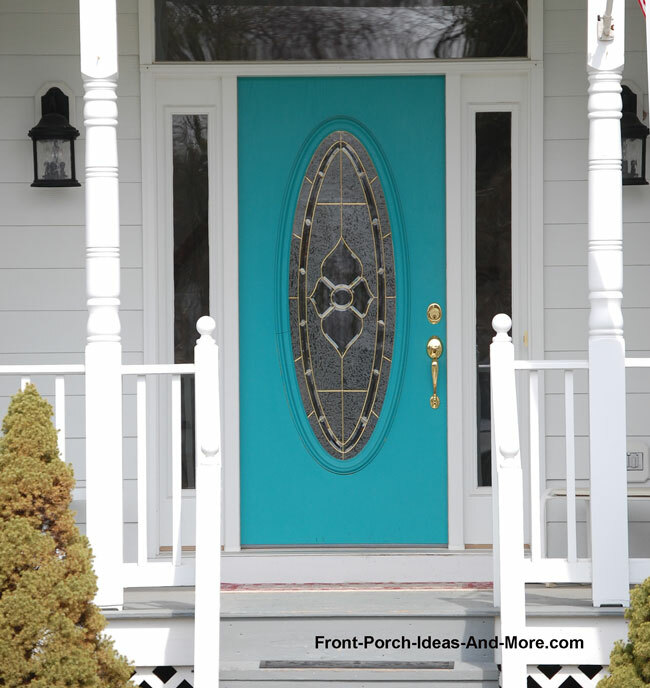 Mary and I've selected various front door styles, colors, and options from around the country to share with you. 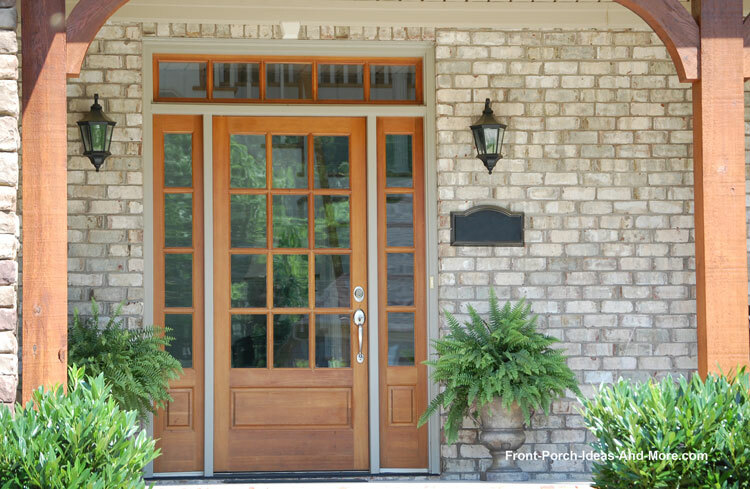 In addition to providing you must-know exterior front door information, we also wanted you to see some fabulous front door options you might not have otherwise considered. 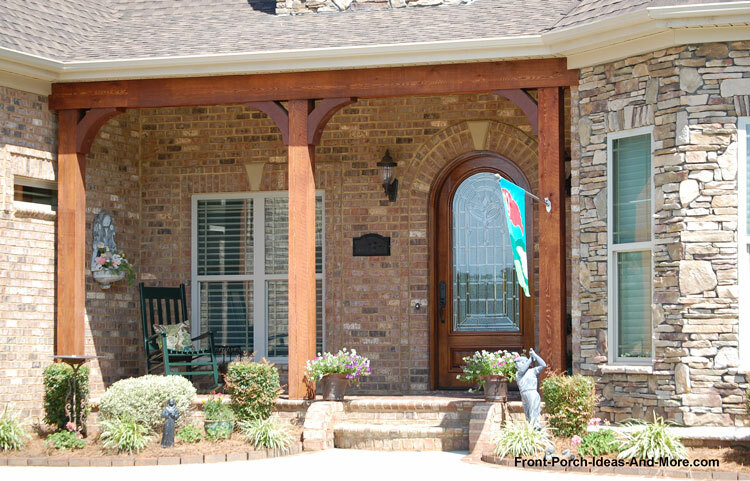 Enjoy viewing the exterior front doors we have in our gallery and envision what one of these doors would look like on your porch. Then check out our front door information that follows. The light panels allow for additional light especially if you have a solid exterior front door. Nice place to display stained glass art also! 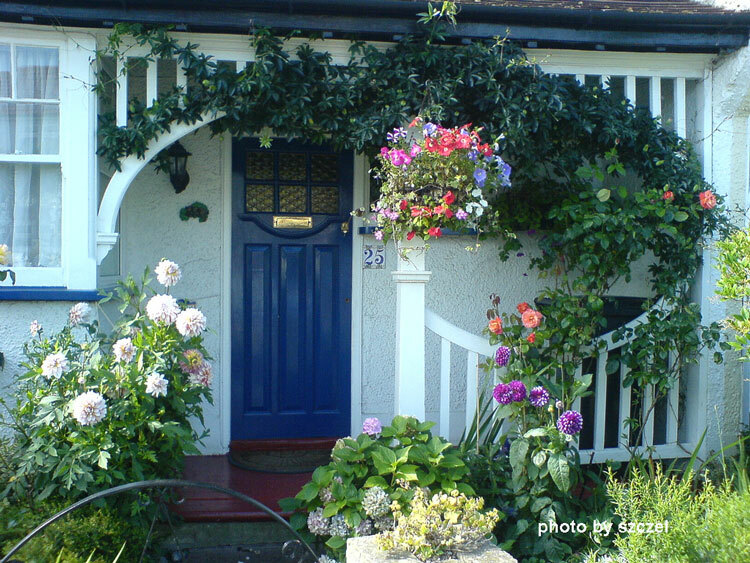 Painting your front door can quickly change the overall appeal of your home. 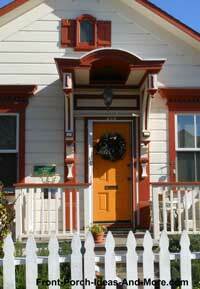 Whether you like subtle colors or ones that stand out to make a statement, choose the right front door paint. 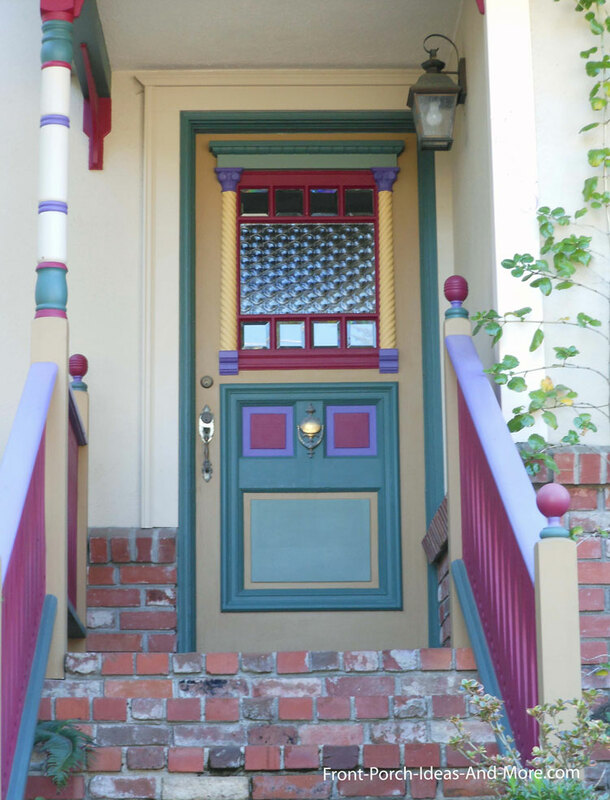 We discovered an amazing front door paint by Modern Masters - take a look for yourself! 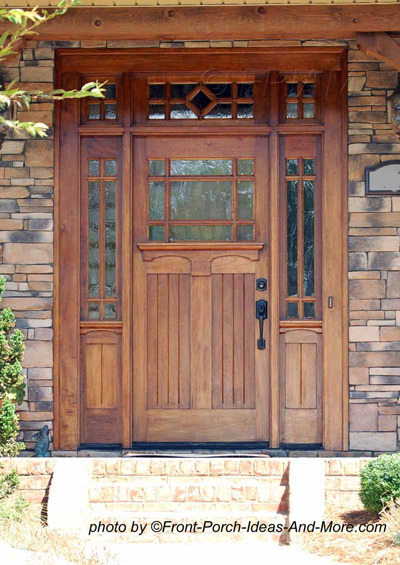 Elegant front doors withstand the elements of time and showcase your home. Note the exquisite pilasters too! 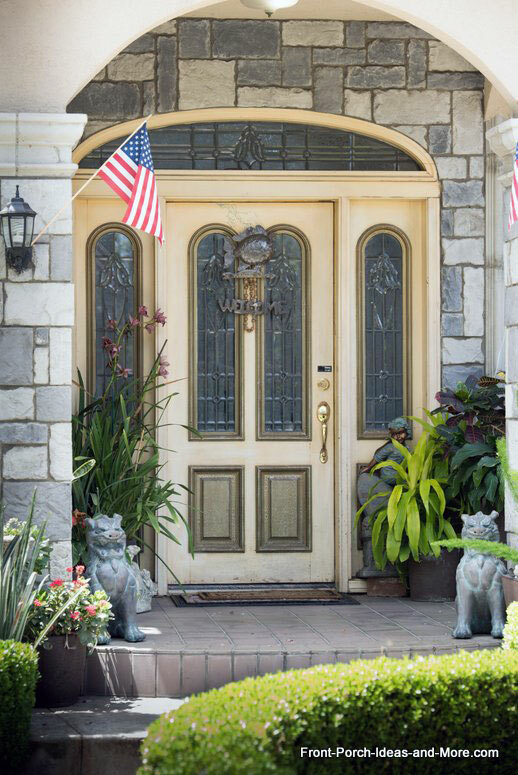 This is a sophisticated steel front door with leaded glass and light panels and transom. 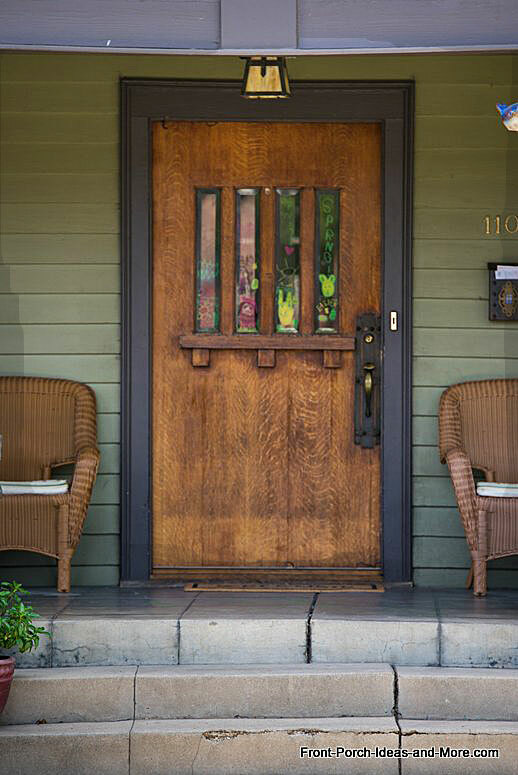 Use this exterior front door design for an elegant appeal; it works well on more lavish contemporary homes. Not only do you gain more light but also timeless beauty. Often called stable or half doors, Dutch doors are constructed so you can open the top half open while simultaneously allowing light and breezes to flow through the top half. Originally designed to keep animals out of farm homes or to keep children indoors, Dutch doors are still popular today. They come in a wide variety of styles. There are also Dutch doors for which you can add screens making them even more attractive. Wooden: You can't beat the natural warmth and rich appearance of a solid wood door. As a woodworker, wood doors are my favorite choice. You can find wood doors made from mahogany, hemlock, pine, walnut,oak, alder, cherry and even juniper. The only drawback is that wood doors need regular maintenance. 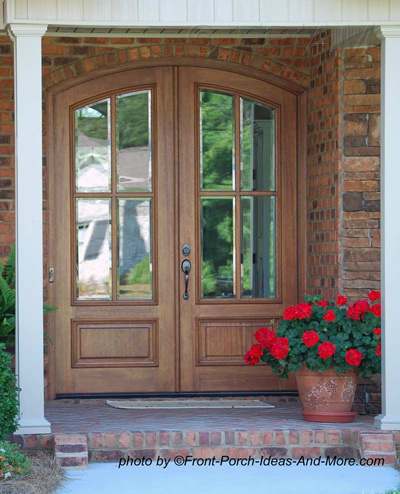 Fiberglass: Virtually maintenance-free and ideal for almost any climate, fiberglass exterior doors will not warp, rot, or split. They can be painted or stained and usually have wood grain finishes so refined that you can't tell it's a fiberglass door. Steel: Extremely low-maintenance, steel doors are made from heavy gauge galvanized steel. They have the best fire ratings (up to 90 minutes or more) and are designed to meet hurricane-prone area code requirements. They too, can be painted or stained to look like wood doors. Composites: The core of composite doors will not rot, warp, or twist when subjected to high levels of humidity because manufacturers blend different materials to form a strong door. The core is then wrapped with real wood. 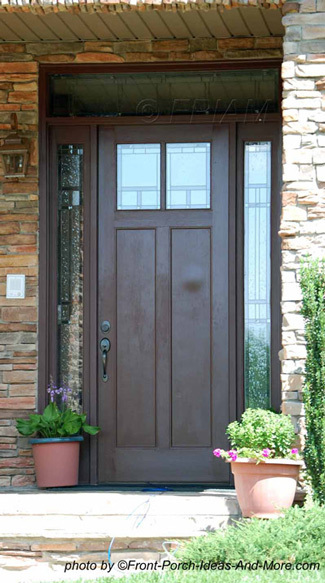 Composite exterior doors offer the beauty of wood, but without the problems of warping or splitting. 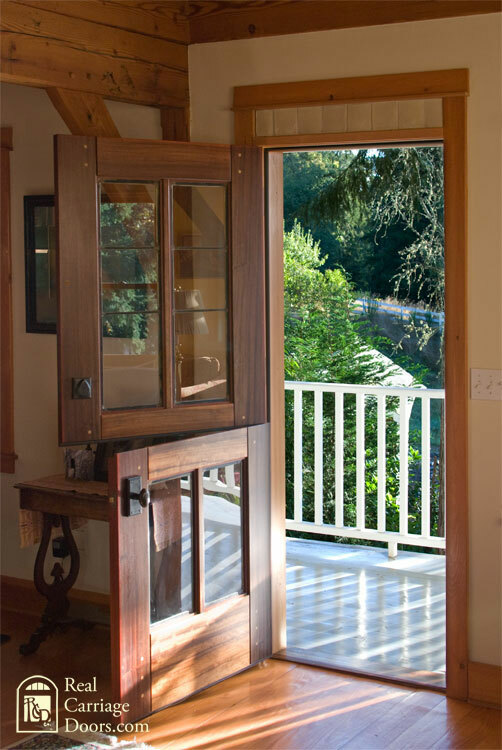 Wood Screen Door: There's nothing quite like the sound of a wooden screen door slamming shut in summer. A beautiful wood screen door will instantly add charm to any home. Easy & Instant Screen Door: When you want to enjoy the outdoors and catch the breeze but can't have a standard screen door installed, consider using an instant screen door. Aluminum Screen Door: Not only are they almost maintenance free, but also add curb appeal as they can be custom designed. And, they will last a very long time. Push Bars: Mary and I like to protect our screen doors by using push bars - can save both repairs and money! 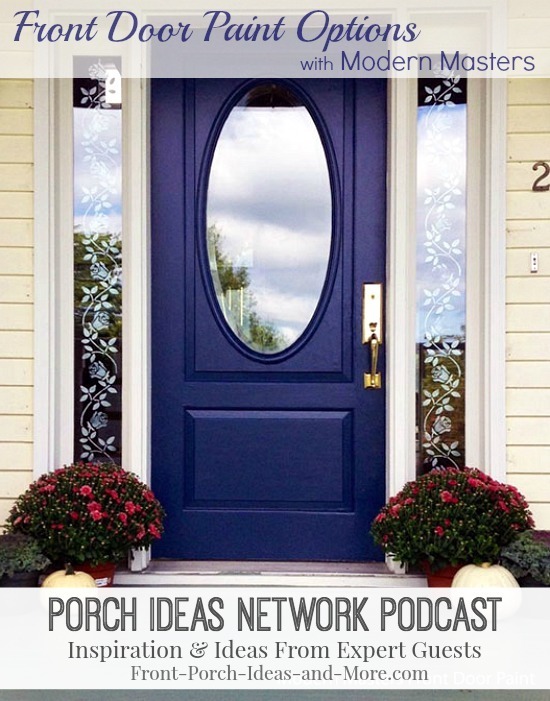 Your porch's front door needs to be strong to withstand the weather, secure to repel intruders, stylish to make a great first impression, and last but not least, fit your budget. 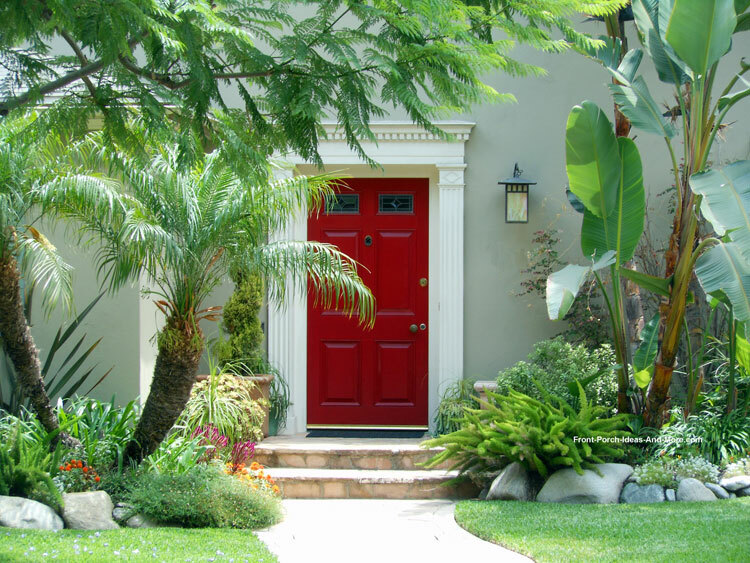 Your front door can also add immense curb appeal and value to your home. Exterior front doors make a first and lasting impression! Queen Anne: The Victorian-era doors have either a single pane or leaded glass in their tops and elaborate carvings and moldings below. Craftsman: Craftsman doors have wider stiles and bottom rails along with flat panels. 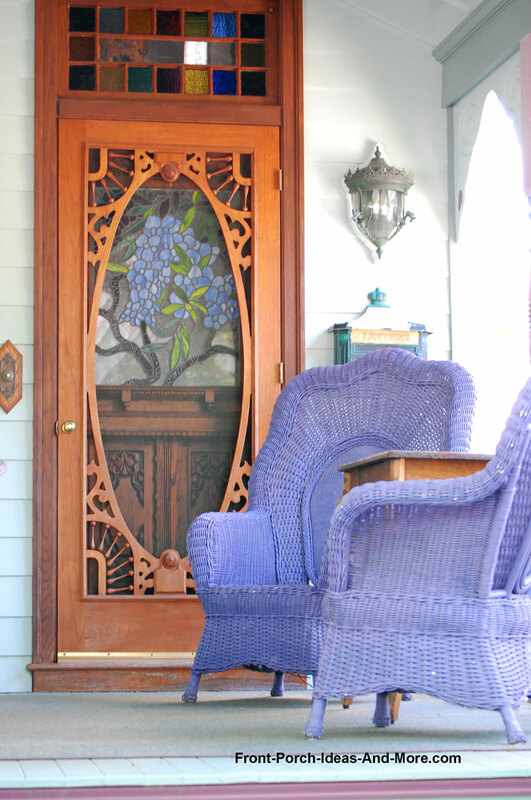 Craftsman era inspired glass designs and windows may have elaborate leaded-glass. 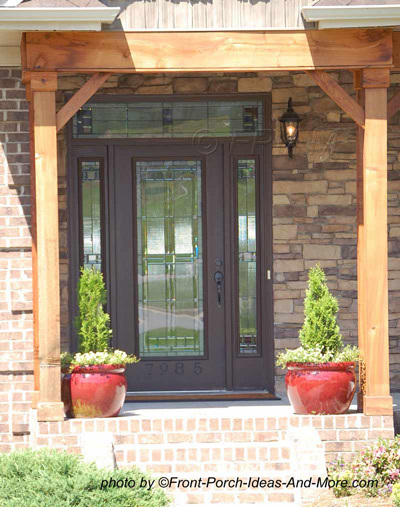 Craftsman style doors are solid and built for functionality over formality. Contemporary: Authentic choice for homes with modern architecture; their visual warmth makes them suitable for traditional homes too. 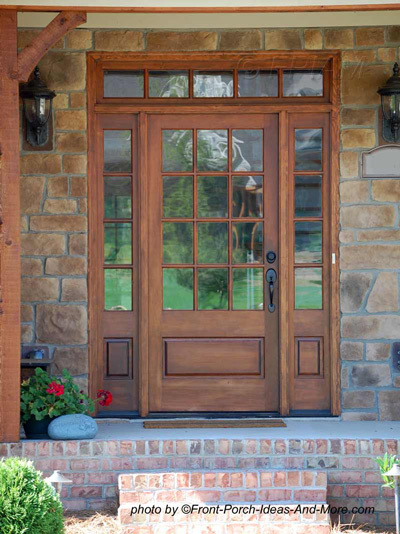 Ranch: Contemporary doors match an exterior that has clean horizontal lines. Tudor Revival: Adapted from the English Renaissance, Tudors have board-and-batten doors, often with arched or pointed tops. Cape Cod: The doors of this post World War II style usually have raised panels and are complemented with upper windows or transoms. 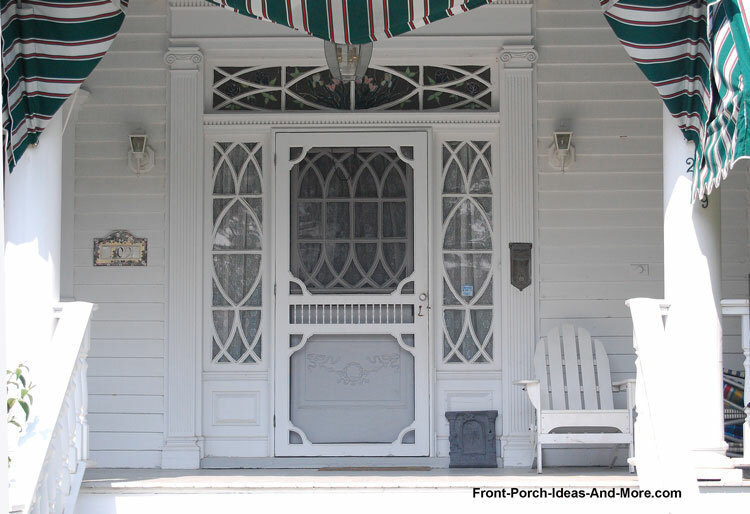 Colonial Revival: Raised-panel doors have a symmetrical style and are accented with a fanlight and flanking sidelights. Select your front door based not only on its beauty, but also on what weather conditions it must endure. 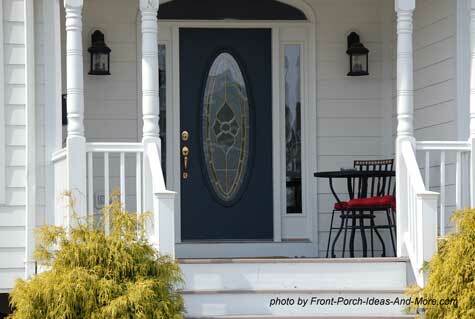 Our guide and photos below will help you select the perfect door for your porch. 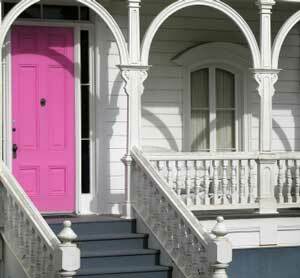 And don't forget to add door decorations to complement your porch to have a winning combination. A colorful wreath can make an ordinary door extraordinary quickly. 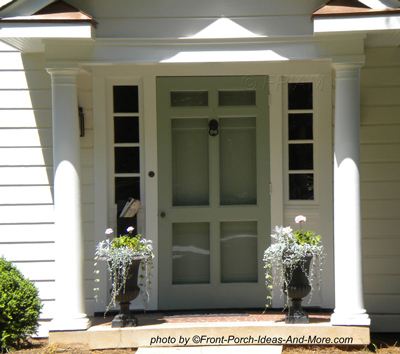 We have more exterior front door photos you must see! See the amazing and ever popular instant screen doors.